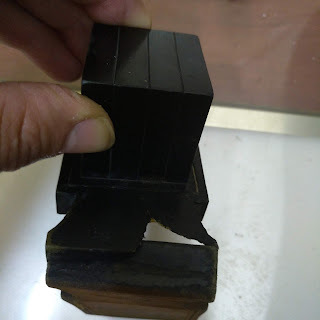 1) Am I allowed to repair a sefer at a Reform Temple? 2) Am I allowed to sell a reform temple a sefer Torah? 3) Am I allowed to do a siyum sefer Torah at a Reform Temple even if they procured the sefer on their own, without my assistance. I'm sure these questions are common with sofrim in the US. What is the halacha lemaiseh on this please? I think you must consult with a leading rabbi in melbourne. Al pi hashkafa this seems difficult to be matir. Perhaps even on the tzad that it's wrong to sell to them or make a siyum sefer Torah that the repairing might be muter. A siyum Sefer Torah or to sell to them should perhaps be ossur because it gives them some sort of "status" or "chashivus"...I plan on asking R' Shammai bli neder to see what he says. Perhaps in Igros Moshe there is a teshuva that discusses such a thing. I don't have the mafta'ach here but cdei to look there. 1. AT the actual place, no. 3. if its AT the Temple itself, no. You should have it finished in a nearby house or hall and then they can have a procession with it into the shul. I have spoken with Rabbi Shusterman (Los Angeles) and the Vaad about this and this is the psak they gave me. I also forgot to mention, the Vaad told me that " It is preferable for them to bring the Sefer Torah to you, rather then you going into the shul and fixing it there"
According to many poskim it is forbidden to sell a sefer Torah to Reform. Igros Moshe Yoreh Deah 1:175 allows one to sell a new sefer Torah (and not a used one since it is horada mkdusha...)to a conservative shul(this was written in 1958). He allows it since they read the Torah and are mechabed the Torah. A shul which is not mechabed the Torah, for example women reading from a microphone from it on Shabbos or spreading it on the floor to see how long it rolls etc... definitely is not allowed. See also Teshvas Vehanhagos vol. 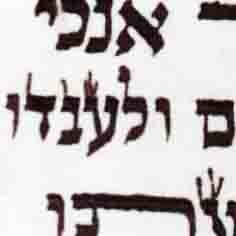 4 Teshuva 236. 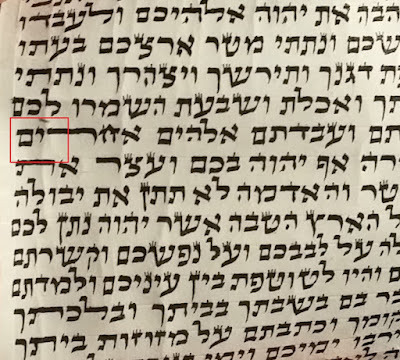 I would think that there is no blanket heter to sell a Sefer Torah to a reform congregation and each specific case should be decided through a Morah Horah (depending on the details of the case). I will ask Rabbi Shusterman on this issue. By the way, which "Vaad" are you refering to? The Teshuvos Vehanahgos there siman 328 speaks about leaving otyiot chalulot to be filled in by a pasul, and he also says that one should be carefull that pasulim don't participate in writing the siyum. I also noticed that when looking up the teshuva, so it was min HaShamayim then that Dovid should post these mareh makomos! The Rabbonim that allow hold that since they will anyways buy one somewhere else we can sell them a Torah and we are not responsible for what they might possibly do with it. clearly prohibits the sale of Sifrei Torah to Reform synagogues on the account that you are mechazik them, and the sale is an act of showing them as if you are giving a partial haskama (credence) to their acts by selling them a Holy kosher Torah. Conclusion: This is a matter of dispute within the Poskim even within the final Hachrah, Halacha Lemaseh. One should ask their Rav for Halacha Lemasah. What is the Igros Moshe Psak? I brought in an earlier comment where Igros Moshe (1:175 Yoreh Deah) speaks about a conservative shul which honors their Torahs. I do not think that the Igros Moshe is refering to a reform synagogue in our present times. Is there another teshuva from the Igros Moshe? the igros moshe held reform and conservative are the same thing.Most reform also honor there torahs. If it is a shul that the torah is not honored you should not sell to them. The teshuva from R' Moshe was in written a long time ago. Things have changed among these "movements" for the worst. There was a time in America when Conservative and Orthodox weren't "so far" apart (at least the Rov of the Kehillas and in certain practices, halachos, etc.) It's hard to speak to Rabbonim here in Eretz Yisrael about it because they don't know at all what these groups were once like or are like now. I know one Rov here that was m'shamesh gedolim in America many years ago before moving to EY. But is more "familiar" with the situation even now among these people. Perhaps I'll consult him as well. It's an interesting shailo with tzadidim l'can u'l'can. I asked R' Shammai Gross today. He said to sell to them he would ossur, but to make a tikkun he would be makil. I didn't ask the third shailo but perhaps that's somewhere in between fixing and selling. I personally am more noteh lhachmir in that case. On the other hand, if they are reading from it in a respectable manner, it is pretty difficult to say that they dont deserve a kosher one. By telling them NO the orthodox community is burning that bridge and ensuring that those Jews will never have a Kosher sefer, which is a big responsibility. This contributes to the movement of women writing seforim, and so forth. So there should defenately be an effort made here to help, but with care. Yesh Koach for all who are looking in to the subject with an aim to help, IT IS TOO easy to just say NO to be on the safe side. Rabbi Dovid Greenfield the Dean יו"ר of Vaad Mishmereth STaM, does not allow to sell a kosher Sefer Torah to Reform Synagogues.